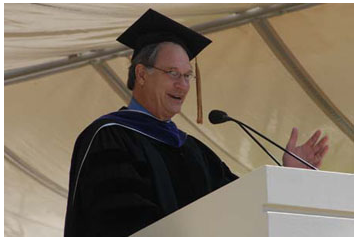 I recently listened to a great commencement speech by Robert Krulwich about the power of storytelling and it made me think about the power of narrative and stories in my business. See, I work in content marketing. To most people, that’s a dull phrase that doesn’t mean anything. But to me, content marketing is the power of businesses using stories and entertainment and ideas to connect with their customers. It’s using these stories instead of banner ads, popup ads, billboards and other branding tactics that try to distract and interrupt you. It’s a powerful change in the marketing and sales landscape. The speech talked about two gentleman who told stories. The first is sir Isaac Newton. Back in the day Newton was asked why he made his famous book about gravity and laws of motion so hard to read, he replied that that he considered writing a popular version that average people might understand but he wanted “To avoid being baited by little smaterrers in mathematics.” Newton intentionally wrote a book in dense scholarly Latin that contained lots of math so that only serious scholars could follow. In other words, Isaac newton didn’t care if he was understood by average folks. He did not believe in the power of storytelling. The second was the story of Galileo. He, unlike Newton, had a flair for narrative. He wanted to tell people what was on his mind. In his famous book, ‘The Dialogues‘ about the sun being the center of the solar system, he didn’t write it in Latin. He wrote it Italian for a mass audience. The writing was gorgeous and poetic and funny. It was a running conversation between good friends who spend four days together in Venice. Their argument is between whether the earth is the center of the solar system or is it the sun. He has little pictures throughout the book and short chapters so it’s easy to read. There are numbers in the book and apparently if you skip them, you don’t miss that much. Because it was so easy to read and became such a hit he was actually sentenced to house arrest for the rest of his life. His stories had that much power. I see businesses every day who want to connect to buyers and impact their lives. Not all businesses realize it yet, but their stories are competing every second with everything else on the web. If you’re selling cars, you’re competing with John Oliver, Facebook and hamsters eating burritos for attention and time, and the only way you can attain it is to make your content compelling and give your potential buyers a reason to read, follow and market to you. Their are some companies that have harnessed their inner Galileo and told some great stories that are useful, and they have buyers eating out of they palms. That’s the way it works.